Pumpkin plays with chocolate miniature chips atop a chocolate Pocky crust. 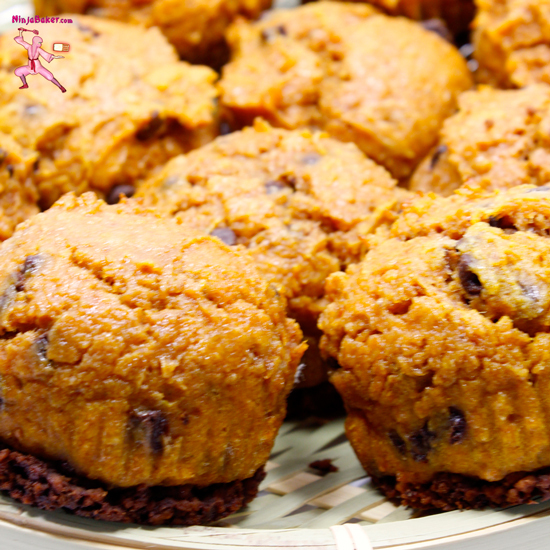 The muffin is soft, moist and a must-make for busy moms. Speaking of homemakers, this recipe is adapted from The Dinner Mom. 1. Pulse Pocky with the coconut oil in a food processor. 2. Pat the mixture into muffin tins lined with cupcake cases. 3. Bake at 350 degrees for 5 minutes. 4. Whisk together the flour, baking powder, baking soda, salt and pumpkin pie spice. 5. Briskly stir in the pumpkin, eggs and yogurt. 7. Lightly spray the crust lined cupcake cases with buttery cooking spray. 8. Divide the batter into the cases. 9. Bake for 24 minutes (rotating the pan mid bake) or until a toothpick inserted into the centers comes out clean. 10. Cool for 5 minutes. Remove the muffins to a wire rack. Or enjoy warm! Ninja Note: A mini ice cream scoop is a great tool for evenly dividing muffin batter.